The tragedies and comedies of the fifth and fourth centuries BCE that remain to us today were almost all written for performance in the Theatre of Dionysos at Athens. The Theatre of Dionysos was first dug out of the slope beneath the south side of the Acropolis in the late 6th century BCE, possibly while Athens was still under the rule of the Peisistratid dynasty. It was rebuilt and expanded many times, and so it is difficult to tell exactly what its original shape was. The Theatre of Dionysos was only one part of the precinct, or temenos, of Dionysos. Initially the precinct contained only the Older Temple of Dionysos and a sacrificial altar. Later a hall, or stoa, was added, incorporating or obliterating the Older Temple, and a second temple built further south. The highest row of seats in the Theatre of Dionysos was 125 feet above the lowest part of the precinct, and before the construction of the stoa and the stage building (skene), the audience could easily see the temples and the sacrificial altars from the theatre. More importantly, from the Athenian point of view, Dionysos himself (represented by his cult statue, which was seated in the front row) could observe not only the choral performances being given in his honour but the sacrifices which were made at his altar. In the mid-fifth century, after rebuilding the ruins of the Acropolis, Pericles built a recital-hall (odeion) to the east of the Theatre of Dionysos. This building was roughly square in shape with a roof described as pyramidal or conical. The Odeion of Pericles was used for many purposes, one being the proagon, a ceremony in which the dramatic poets announced the titles of their plays and introduced their actors. Members of the chorus would wait in the Odeion to make their entrance. Pericles also introduced the Theoric Fund to subsidize the cost of theatre tickets for the poor. The price of a ticket to the Theatre of Dionysos was two obols, as much as a laborer earned in a day. Because Greek tragedy and comedy originated with the chorus, the most important part of the performance space was the orchestra, which means 'a place for dancing' (orchesis). A tragic chorus consisted of 12 or 15 dancers (choreuts), who may have been young men just about to enter military service after some years of training. 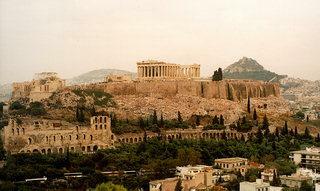 Athenians were taught to sing and dance from a very early age. The effort of dancing and singing through three tragedies and a satyr play was likened to that of competing in the Olympic Games. In contrast with the chorus of 12 or 15, there were only three actors in fifth-century Athenian tragedy. The original word for 'actor' was hypokrites, meaning 'answerer,' for the actor answered the chorus. Thespis is said to have introduced (and been) the first actor, later called protagonistes (literally 'first competitor'). The introduction of a second actor (deuteragonistes) is attributed to Aeschylus and the third (tritagonistes) to Sophocles. There are no one-actor plays remaining to us, though Aeschylus' earliest play, Persians, requires only two actors. Ordinarily each actor would undertake to play several different roles, and it is usually possible to divide the speaking parts in a Greek tragedy up by determining which characters were in the same scene. Often the division of roles had some thematic significance relevant to the play. We know that the audience could tell one actor from another, despite wearing a mask and costume, because a prize for the best actor was introduced in 449 BCE. Very occasionally a single role might be divided between two or more actors, as in Sophocles' Oedipus at Colonus. The only remains of this first theatre, used by Phrynicus, Aeschylus, and possibly Sophocles, are six of the stones which made up the wall of the orchestra. According to the original excavator, Dörpfeld, they once formed part of a circle some 85-88 feet (24-27 meters) in diameter. The stonework is in a rough style known as 'polygonal' which was used in early Greek times. The initial seating area for spectators (theatron) may not have required much excavation of the hillside, but it was still necessary to shore up the orchestra with retaining walls and to move considerable quantities of earth to make an appropriately level place for the choruses (dithyrambic, tragic, comic, etc) to dance. It is possible that there was no skene (stage building) until roughly 460 BCE. Aeschylus' Oresteia is the earliest extant drama which uses the skene. His other four plays (Persians, Seven Against Thebes, Suppliants, Prometheus Bound) may well have been performed in the orchestra, with the actors and chorus on the same level. Previous to the invention of the skene, entrances could only have been made through the two ramps, called eisodoi, which led onto the orchestra. The archaeological evidence suggests that between 460 and 431 BCE (and probably at the time the Odeion was built) the orchestra was shifted north and west of its original position, and the hillside excavated further to make a more secure foundation for the wooden seats. By this point it is likely that the seats were divided into at least ten different wedges, for the ten 'tribes' which made up the citizens of Attica. By the fourth century BCE, and possibly during the fifth, there were 13 of these wedges, called kekrides in Greek. In front of the new terrace wall, which became the rear wall of the stoa, was a projecting rectangle of stone 26 feet long and 23 feet 3 inches wide. The wooden posts which supported the temporary skene fit into grooves in the terrace wall. The fifth-century skene was not a permanent building, but a temporary construction of wood, placed across the rear of the orchestral circle for the dramatic performances at each year's festival. Nevertheless its invention brought about a massive change in theatrical practice and in the way in which performers and playwrights used space to create meaning. The interior of this flat-roofed building was the 'backstage' area, but in visual terms it was not so much 'behind' as 'within', an enclosed space which, like a real house, was the dominion of female characters. As a rule, actors could and did step out of the skene and join the chorus in the orchestra, but we have no record of the chorus ever having entered the skene. The fifth-century skene was frequently a single-storey building with one central door, which could take on the identity of a palace or a temple. At times, a hut or a cave could be represented. In the course of the fifth century, some form of perspective painting was introduced, assisting the front of the building (or removable flats placed before it) to suggest the type of location required for a particular play, but such properties and scenery as existed appear to have been more symbolic than illusionistic. Divinities could appear suddenly on the roof via a trap door. Characters which were specifically stated to be flying (such as Bellerophon on Pegasus) could be swung into the air above the stage space by means of a simple crane, called the mechane or geranos. The earliest known use of the mechane was in the year 431, when Euripides used it at the end of his Medea. Because the mechane had to support considerable weights (and counterweights) it was probably supported by the projection of stone which extended into the orchestra from the terrace wall, and affixed to one of the posts which supported the skene. Interior scenes could be brought outside by means of a low rolling platform called the ekkyklema ('thing which rolls out'). Because performances took place in daylight, and because of the angle at which the productions were seen (at a considerable distance, and usually from above the playing area), it was not possible to see the interior of the skene. (This is just as well, because the actors needed to change masks, attributes, and possibly costumes inside the skene.) The ekkyklema was used to display the bodies of those who had been killed indoors and to wheel out characters who were ill. The Old Comedy of Aristophanes frequently made fun of the stage machinery and drew deliberate attention to it, but it was an accepted convention in performances of tragedy. The large size of the theatre (in its final form it seated 20,000 people) and the distance of even the nearest spectators from the performers (more than 10 meters) dictated a non-naturalistic approach to acting. All gestures had to be large and definite so as to 'read' from the back rows. Facial expression would have been invisible to all but the closest members of the audience; the masks worn by the actors looked more 'natural' than bare faces in the Theatre of Dionysos. The masks of tragedy were of an ordinary, face-fitting size, with wigs attached, and open mouths to allow clear speech. Contrary to some later theories, there were no 'megaphones' in the masks, and their decoration and expression was quite subtle, as vase paintings from the 5th and 4th centuries attest. Theatrical masks were made of wood (like the masks of Japanese Noh drama), leather (like the masks of the Commedia dell' arte, or cloth and flour paste (like many of the masks used at the Carnevale of Venice, and many masks made for modern productions today). Various theories are advanced in favor of each material, but no originals remain, only stone carvings which may have been used as mask-molds and the paintings on pottery. Designed by Animagic for Didaskalia, this model will give you a better impression of a Greek tragic mask, inside and out. Each set of three tragedies was followed by the performance of a satyr play, a short spoof of a myth related to the theme of at least one of the tragedies. The ordinary human characters in these plays wore tragic masks and costumes, but the chorus of half-human satyrs wore pug-nosed, pointy- eared, bearded masks, furry shorts, and normal-sized erect phalluses (probably made of leather.) Satyrs danced a special kind of dance called the sikinnis, in which they pranced like horses. The illustration is taken from the Pronomos Vase, which shows the entire cast of a satyr-play. The masks of Greek Old Comedy were distorted caricatures, sometimes of real people. They were meant to be ugly and silly in keeping with the ludicrous padded costumes worn by comic actors. While tragic actors wore elaborate pattern-woven garments which were similar to the robes of priests and musicians, comic actors wore loose body stockings padded at the breast, buttocks, and stomach, with long floppy phalluses for the male characters. (Except in the case of Aristophanes' Lysistrata, where they were long erect phalluses.) The chorus of Old Comedy was often composed of non-human creatures, such as wasps, frogs, birds, or even clouds. The 24 choreuts of Old Comedy were adult men, as were the three speaking actors. Greek New Comedy, which was first performed in the 4th century BCE, was in many ways more similar to Euripidean tragedy than to Greek Old Comedy. The masks were fairly naturalistic, the costumes devoid of padding. The plots went from the fantastical to the domestic. The TDA had been rebuilt in stone by the time Menander began producing New Comedies. The skene was more elaborate than before, and how had two or three doors instead of just one. The chorus was divorced from the action of the play and no longer the concern of the playwright at all. During the Hellenistic era the TDA was again rebuilt, with a skene several storeys high. Actors formed a professional union called the Artists of Dionysus, and were used as diplomatic couriers. By this time theaters had been built in many parts of Greece, including Epidaurus/Epidavros. After their conquest of Greece in the late second century BCE, the Romans also built or redesigned theaters and other performance spaces in Greece. Many of the theaters which you can see in Greece today are actually Roman. At present the reconstructions show the latest (Hadrianic) phase of the Theater of Dionysus, not the space as it was used in the Fifth Century. A pictorial tour of the remaining Greek and Roman theatrical buildings around Greece, with maps and descriptions. They are hosted by Gaiorama/Georama in Greece. Brooke, Iris, Costume in Greek Classic Drama, Greenwood Press, 1973. Csapo, Eric and Slater, William The Context of Ancient Drama, University of Michigan Press,1995. Green, Richard and Handley, Eric, Images of the Greek Theatre, British Museum Press, 1995. Ley, Graham, A Short Introduction to the Greek Theatre, University of Chicago Press, 1991. Lonsdale, Steven, Dance and Ritual Play in Ancient Greek Religion, Johns Hopkins University Press, 1993. McLeish, Kenneth, The Theatre of Aristophanes, Thames and Hudson, 1980. Pickard-Cambridge, Arthur, The Theatre of Dionysos in Athens, 1946. Pickard-Cambridge, Arthur (revised by John Gould), The Dramatic Festivals of Athens, 1980. Rehm, Rush, Greek Tragic Theatre, Routledge, 1991. Taplin, Oliver, Greek Tragedy in Action, Oxford University Press, 1978. Taplin, Oliver, The Stagecraft of Aeschylus Oxford, 1977. Taplin, Oliver, Comic Angels, Clarendon Press, 1993. Walton, J. Michael, Living Greek Theatre, Greenwood Press, 1980. West, M.L., Ancient Greek Music, Oxford: Clarendon Press, 1992. Wiles, David, The Masks of Menander, Cambridge University Press, 1991. Wiles, David, Tragedy in Athens, Cambridge University Press, 1997. Winkler and Zeitlin, eds., Nothing to Do with Dionysos? Princeton University Press, 1990.